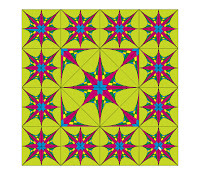 To celebrate the recent success of Raconteur at the South Australian Festival of Quilts and also the fact that it appeared on the cover of the latest issue of Australian Patchwork and Quilting I am having a sale on the pdf patterns check out the sale prices here. Well I have been away for the past two weeks and so am running behind in selecting the winners for the two recent competitions which ran through this blog. I just did a random spin the wheel and see where it stops to find that Linda Hubbard from Canada was the winner of Quiltmaker's 100 Blocks but as she had already won a copy of the magazine she kindly said to redraw it and so Trish from Tennessee is the second lucky winner. After clearing that draw up I then did the next draw and Fran C from Aussie is the winner of one of the collections from my Raconteur patterns. Fran has chosen Collection 8 and I can't wait to see what her collection looks like when she finishes. A few weekends ago I went to the NSW Quilt Guild's retreat at Jamberoo. This is usually held in September but, luckily for me, this year they had to run it later as the usual place had already been booked for that weekend. It was a perfect weekend. Company was lots of fun. Food was great and many things were completed..or at least there was great progress. 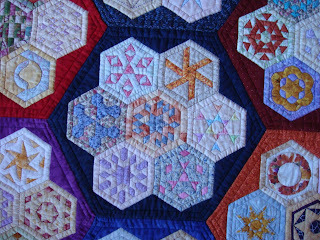 Three quilts which I just adored were the New York Beauty which was being made by .. the person who sat beside me all weekend and whose name I can't remember right now for the life of me :( but it is still a beautiful quilt. 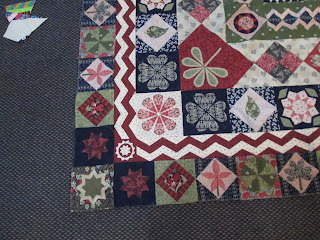 Another beautiful quilt was this one, which if I remember correctly is an Anne Summerland reproduction pattern. It has also been a while in the making but will definitely be worth the wait when it is finished. 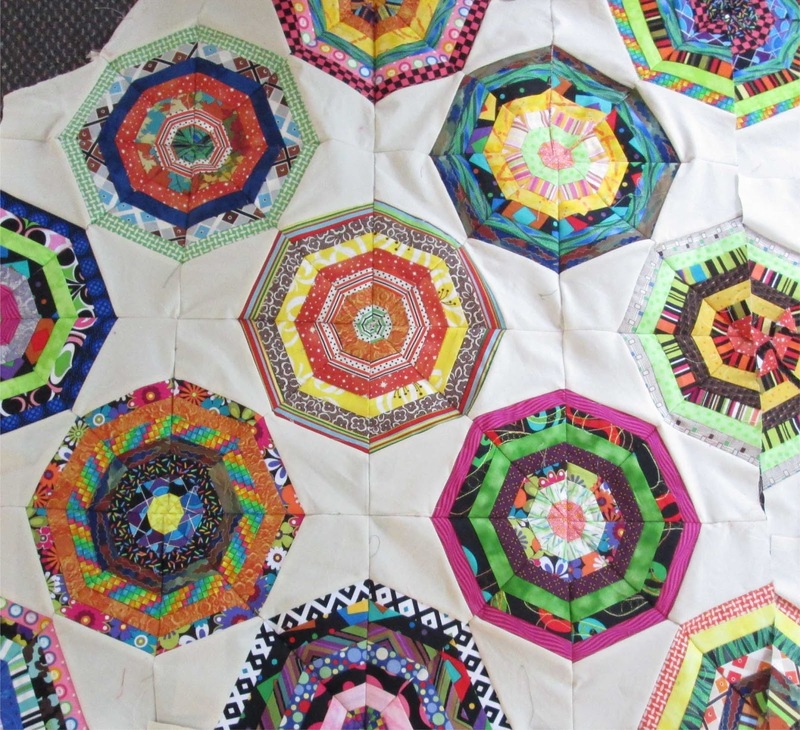 The final quilt which I would love to have a go at some time was being made by Judith D. It came from a magazine and looks similar to the Milliefirore Quilts designed by Willnye Hammerstein. 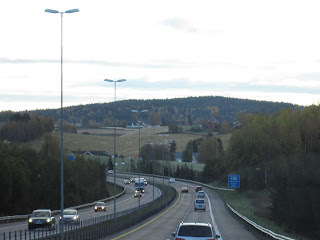 A couple of weeks ago we visited our youngest son who now lives in Oslo. What an amazing place. 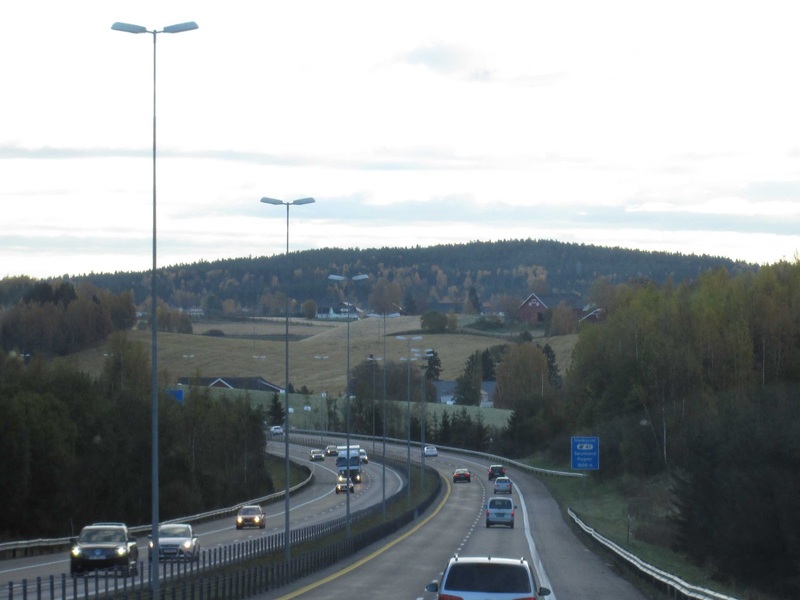 This photo shows you what it is like 5pm on a Friday just ten km's from the centre of Oslo. Notice the lack of pollution and traffic. Here you can see his block of units on the RHS of the road and his office on the LHS. This photo was taken just to show how far it is he has to travel. If you look in the distance you can see a red roofed building. 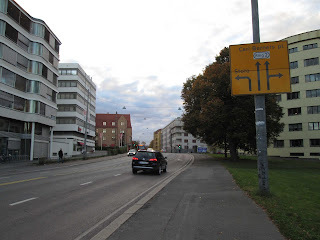 There are traffic lights there and if he wants to go to work during rush hour, say between 8.30am and 9.00am then he has to walk all the way up to the lights and then back down to his building. Needless to say he doesn't go to work until 10 so as to avoid the traffic! 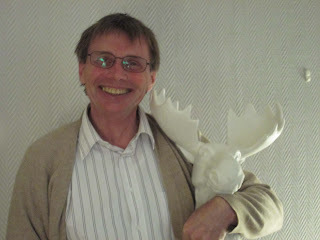 While we were visiting it was Paul's birthday and so Richard proudly gave him a true Norwegian souvenier... a HUGE ceramic moose head. Just what one needs when flying..huge and breakable. He suggested we could take it in our hand luggage but I thought it might be considered a weapon die to the weight and size. Luckily Wilbur survived the flight home and now has pride of place in the pool room (refer "The Castle"). 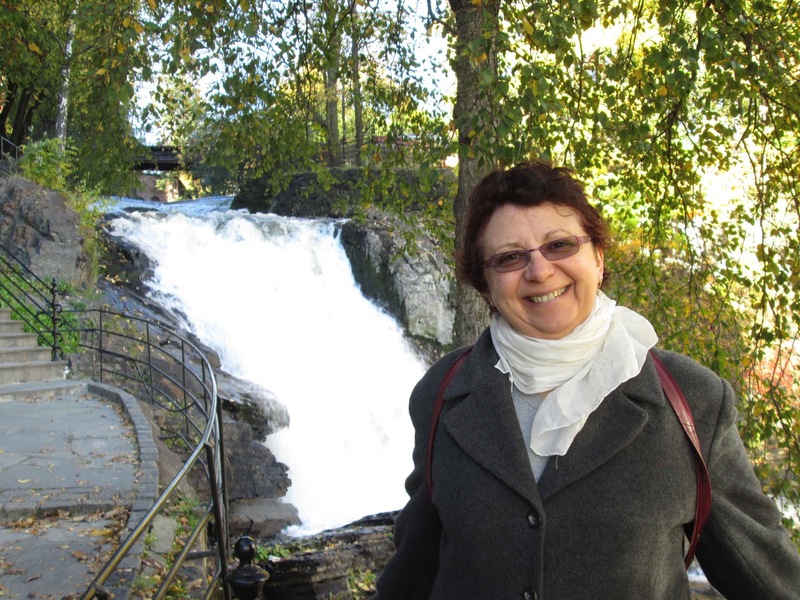 And last but not least this waterfall is just behind Richard's place. This river runs through the centre of Oslo, providing one of the most idyllic walks I have encountered in a built up area. 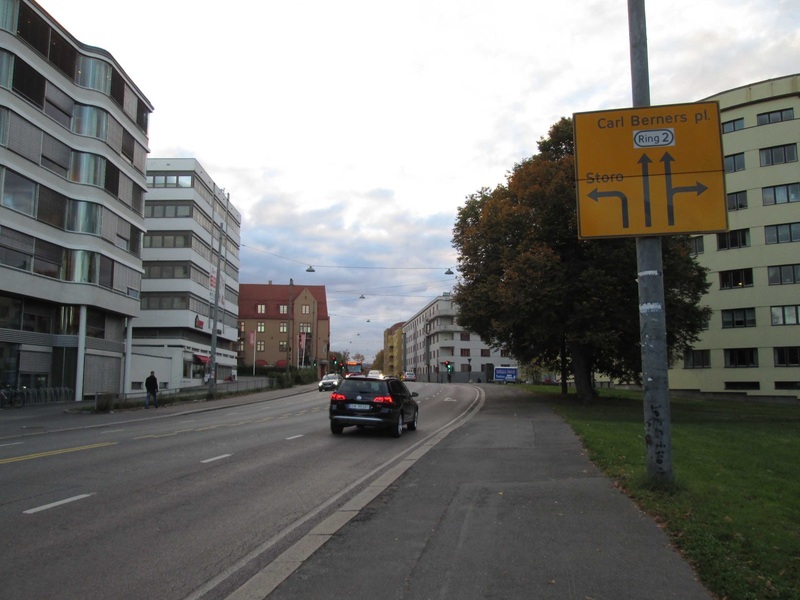 There are no free standing houses in this area. All are medium or high rise but there are many beautiful parks and walks. Just a merely 4km from the city centre there are three wonderful lakes and all are accessible by regular public transport. Definitely a place worth visiting. If you like cold, snow and lack of sunshine then it would also be a great place to live. While wandering around London recently we came across this sign. Funny now when one reads it but wouldn't it have been terrible to have lived in times when people were actually drawn and quartered? We have been very lucky lately and managed to visit both of our boys who live overseas. PJ lives in Oxford and works at one of the oldest colleges at Oxford Uni. 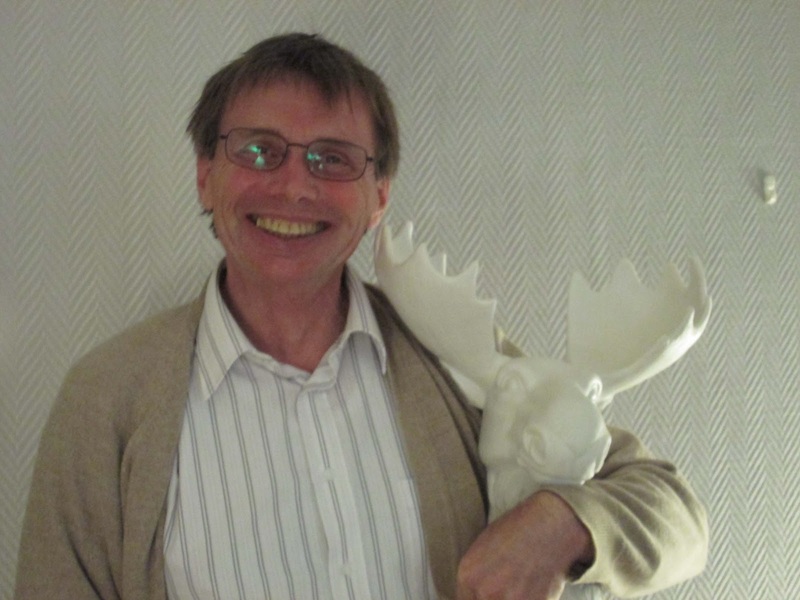 He has a research fellowship with All Souls College and is having the time of his life there. While wandering around we saw lots of wonderful old buildings, is there anything else there? The photo above is of his office. His room is just to the left and one floor above the entrance. Fantastic view of some of the best buildings in Oxford. 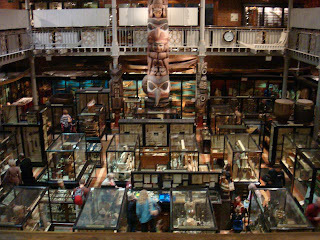 While we were there he took us to see Pitt-Rivers Museum. 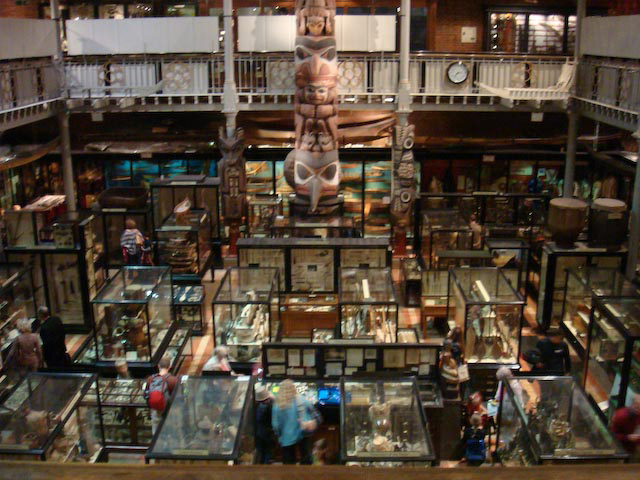 The artifacts in this library were donated by Pitt-Rivers onthe condition that they be displayed in the same manner he had displayed them. Consequently there are thousands of things all crammed together with his original tiny hand written labels. In this cabinet you can see some shrunken heads and the labels. Did you realise that it was only the heads of important people that were shrunk? They scalped the head off the skull and then filled it with hot sand(?) or something until it shrank and then filled it to regain the correct form. Loved wandering around the place, especially as it was term break and there were very few people around. Mind you the old cobblestone paths get sore on the feet after a while. 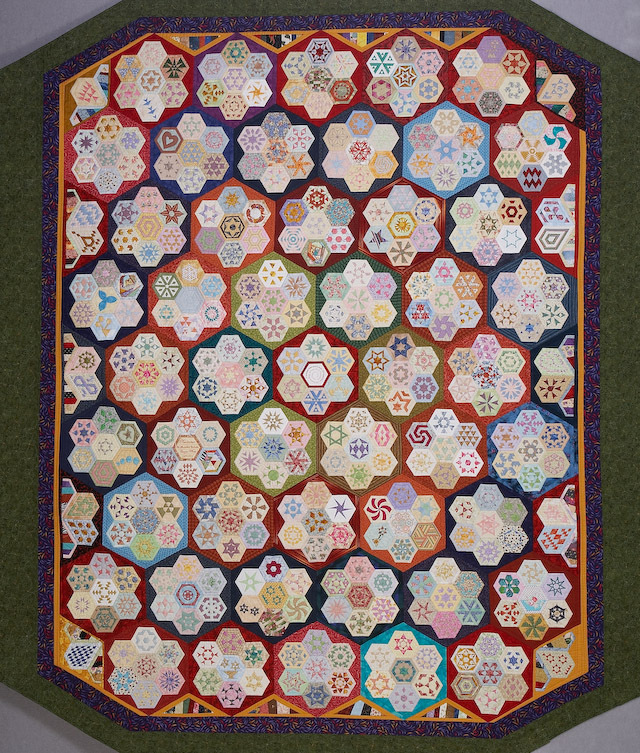 I have just heard that I won two prizes at the South Australian Festival of Quilts with my quilt Raconteur - the Storyteller's Collection. It won second prize in the Open Traditional and also the Retaining the Tradition Award..... Really brightens up the day. 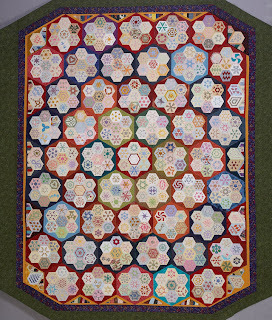 I know this isn't a great photo... actually in truth it is a great photo but the problem is that this is a king size quilt of miniatures and so is very very hard to photograph. 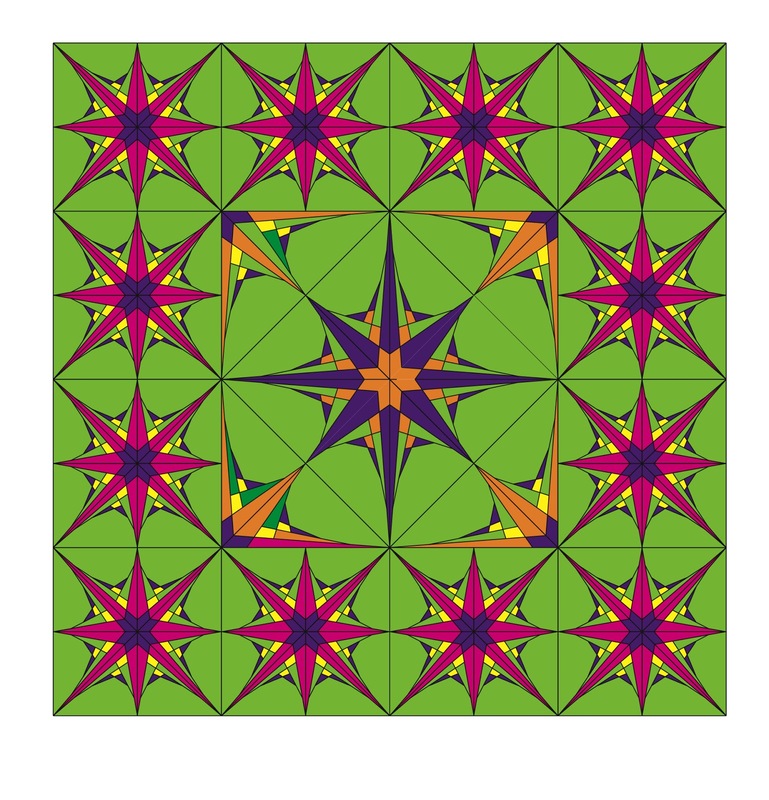 You can see several photos of the individual blocks if you look through the blog. I will select the winner on the 23rd November. 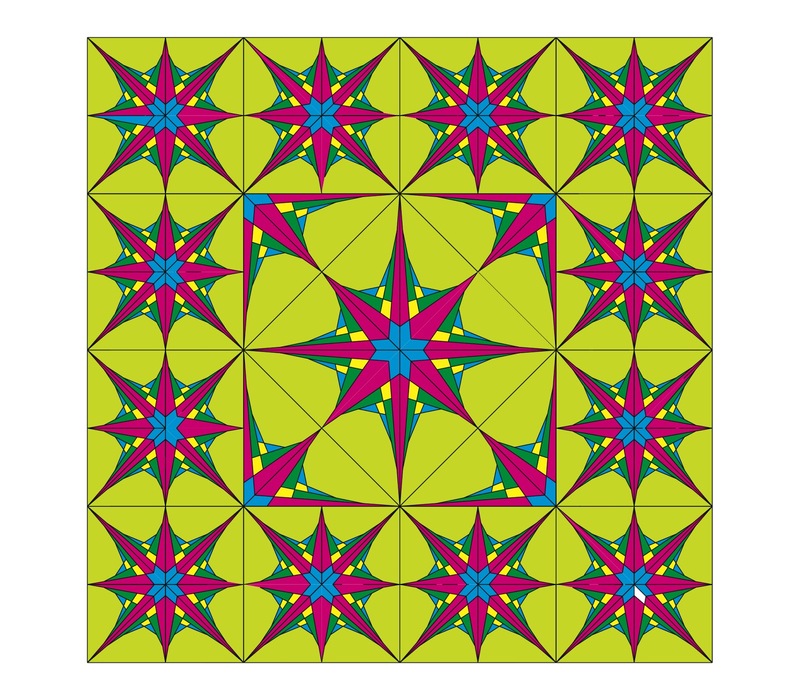 Well here it is a Xmas runner.. oh if only it was as easy to make as it is to draw and colour. Such is life but here is one colour version for a Xmas runner. I realise that many people like other colours these days for Xmas but it is impossible to present every version. Xmas in Australia happens in Summer and that is also when much of our fruit rippen. Unfortunately we live in a fruit fly area and these 'darling' little fellows decimate just about every piece of fruit that hasn't been sprayed, even if the fruit is picked while still green. 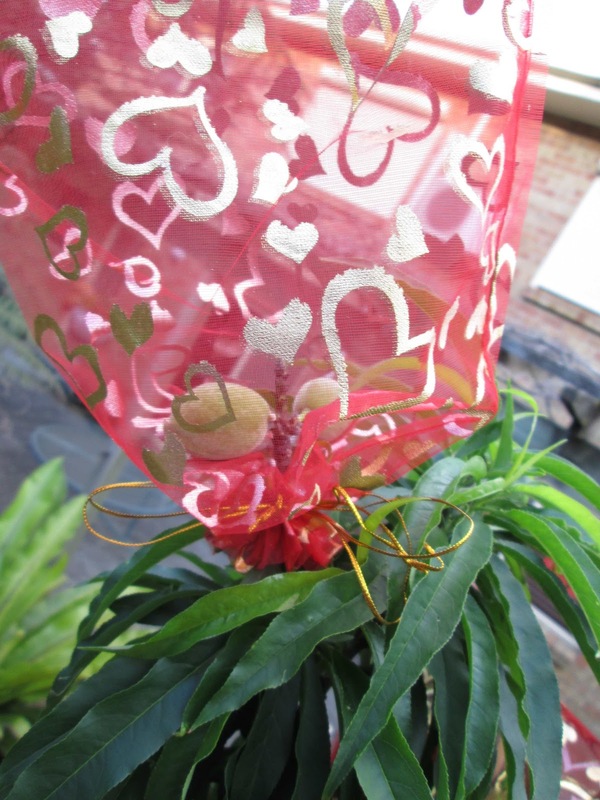 This year my husband decided however that he wasn't going to spray the fruit fly every two weeks. 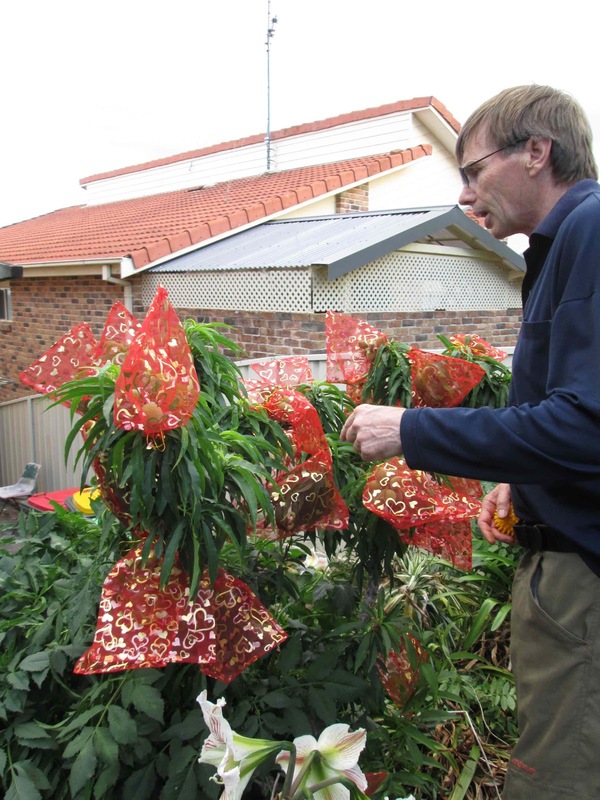 After some web surfing he discovered that many home gardeners now bag the fruit to keep off the fruit fly. Yesterday his parcel arrived from China, amazing how much cheaper it is than buying locally, only $16/100 including postage. In the $2 shop they are usually 2 for $3. So here is a photo of my husband 'bagging' his peaches. And here is a close up of two of his apricots inside the bag. He has bagged our apricot tree, peach tree and also the maqui berry bush, lucky he keeps all trees trimmed to under 2m :) The berries have been bagged in a hope of preventing the parrots from feasting on them. Our garden is a veritable paradise for animals. We used to have a blue tongue lizard until last year and he was wonderful for keeping out slugs and snails out of his strawberry plot. Unfortunately for some reason last year he disappeared and so it seems as though this year we will have to look into something... anyone have a blue tongue they want relocated? Well here it is Wednesday and now I can unveil my latest block. It has been really great seeing the fantastic array of blocks and if you haven't yet won your own copy please leave your name below for yet another chance. If you are listed as anonymous please note I won't be able to track you down if you are the winner. So please log in somehow; via your own blog or webmail addy are usually the easiest ways. Now the block above is my final block. I had originally planned for the outer green to be the same as the inner green but unfortunately miscalculated how much fabric those outer sections needed. My original plan was to make the block in colours similar to the layout just above and to the left but couldn't find the right yellow for the background. Yes I know it doesn't look yellow on the web, but in real life that is yellow. I included the layout on the right just to show you the difference colour can make. My third layout was my first plan for the medallion layout. 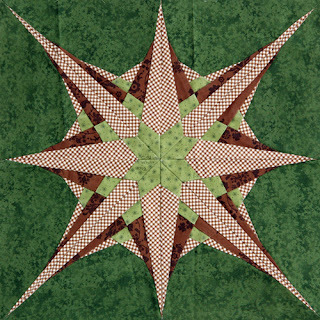 This one would be perfect for someone who likes applique with all those open spaces near the middle. However as I personally don't do applique it would be the design I am least likely to use. Btw if anyone wants to try any of these three layouts you will need to increase the block by 200%. The extra part blocks in the first two layouts are regular size. And if you, like myself, have way too many UFOs but still want to try out this block why not make a table runner. Three full blocks plus two quarter blocks with a small border makes a table runner a bit under 50inches in length and approximately 16in wide. Perfect for Xmas..... just had a thought check back later.. say tomorrow and I should have uploaded a Xams table runner for those who like red and green that is. 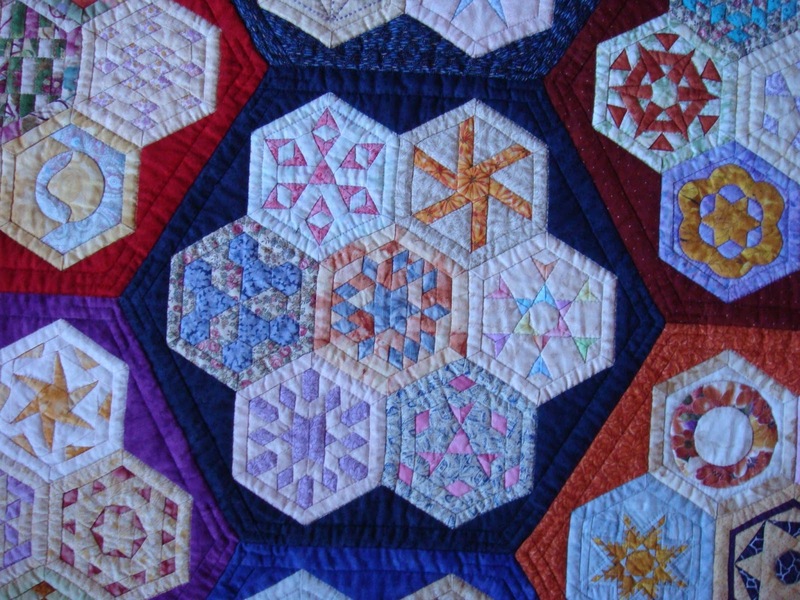 Anyway back to the important thing... leave your name so you can be in the draw for your own copy of Quiltmaker's 100 Blocks Issue 6. Good luck. Well it's almost my big day for the 100 Blocks blog tour. My post will go live just after midnight on Wednesday Sydney Australia daylight savings time, that is +11 hours GMT so if you are here and my post isn't posted yet then please check back. Although each day's targeted blogs are posted at 12.01am on Quiltmaker's Quilty Pleasure blog not everyone lives wherever Quiltmaker is based. 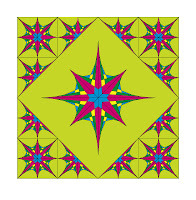 Previous posts there have been people like me who have attempted to guess when we should go live to line up with Quiltmaker but this time round they have decided it is best if everyone simply goes live at 12.01am local time. So if you are here before Australia's midnight kick off please check back in a few hours. 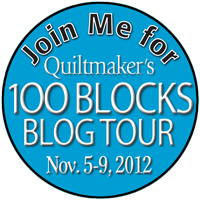 Well today is the beginning of the Quiltmaker 100 Blocks blog tour. 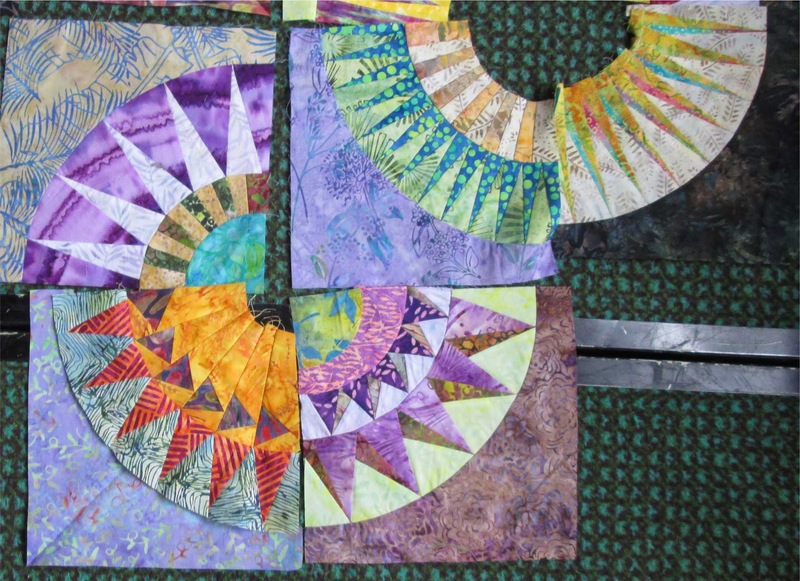 Each day everyone visiting the Quiltmaker's blog Quilty Pleasures has a chance to win their own copy of the magazine plus a host of other prizes. 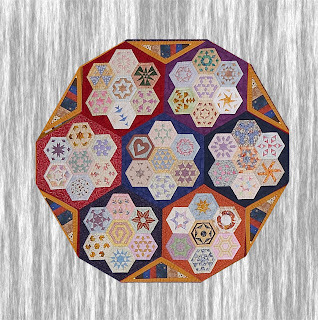 I have been working hard lately to release patterns from my latest quilt, Raconteur - The Storyteller's Collection and to celebrate finishing many of the patterns I have donated a set of instructions for this wallhanging from the quilt. The wallhanging consists of seven of the collections, joined together and then finished off with striped triangles. I have just this night worked out how to add the triangles to my image and although it isn't perfect I think you can still see what it will look like. The wall hanging still needs a small yellow border but I have no idea how to do that so I shall leave that to the viewer's imagination. 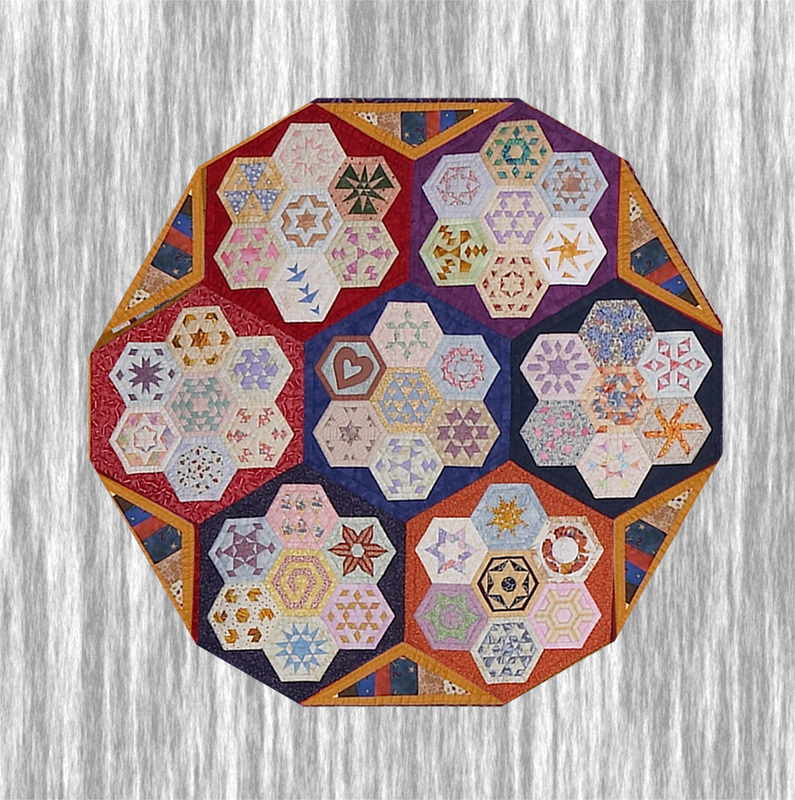 This is my first time that I have sponsored a blog tour and I can't wait to see another version of my quilt. Good luck. I just received a parcel and you won't believe what was in it! 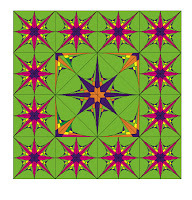 Yes Issue 6 of Quiltmaker's 100 Blocks. It is a great magazine and there are some fantastic blocks in here. I had been told a couple of weeks ago that my block was going to be in this issue but I didn't realise that November would arrive so quickly. Starting next Monday there will be a blog tour where you have the chance to win your own copy of the magazine. Each day Quiltmaker will feature several of the designers and on each of their blogs you have a chance to win a copy of the magazine. My day is Wednesday so be sure to stop back in for a chance to win my copy. 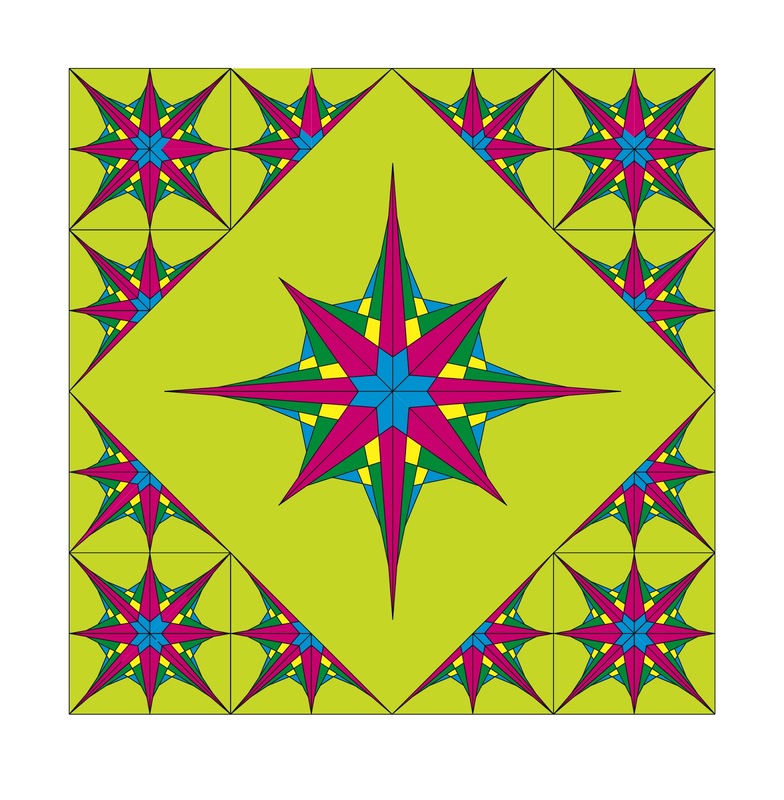 Also by visiting the main website at Quiltmaker you also have a chance to win some amazing prizes from many sponsors. 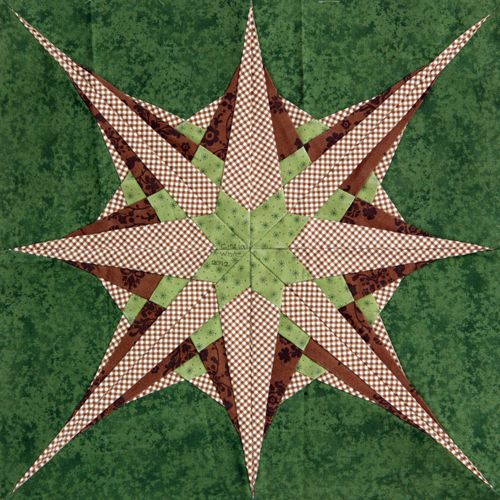 So when you find some time go to Quiltmaker's Quilty Pleasures every day and check it out.